The Nasdaq Trader® website is the daily information and customer support portal for over 1,400 organizations trading multiple securities classes and distributing NasdaqSM market data. The Nasdaq Trader website is the source of information for anyone trading on The Nasdaq Stock Market®, The Nasdaq Options MarketSM and Nasdaq PHLXSM. Reach industry professionals who are accessing essential trading information including Reg SHO Threshold Securities, Short Interest, Trading Halts, System Status and Market Participant Monthly Volume Reports. Nasdaq customers, both in transactions and market data, are required to access this website for both administrative and product information. 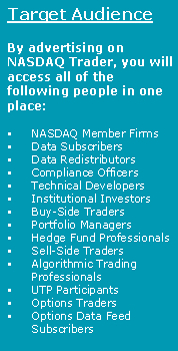 In addition,the Nasdaq Trader website attracts both equity and derivative traders. Nasdaq is the world's largest exchange company with trading, listings,technology and public company service capability spanning six continents. Nasdaq is and a well-recognized household name. Building on a reputation for innovative technology and worldwide growth, the Nasdaq brand lends global appeal to any advertising campaign. Nasdaq recently launched a self-enrollment program that allows users to select targeted news alerts they wish to receive from the Nasdaq Trader website. Leverage these announcements to reach thousands of viewers via sponsored banners on Equity and Options Trade Alerts.